Established for over 30 years Finishing Touches offer a full range of wood and furniture care services. 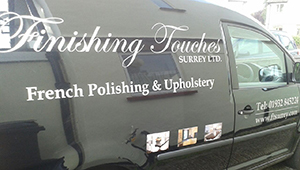 We are able to offer an on or off site polishing service and can safely transport your furniture to our workshop if necessary. We have managed to keep up with new & modern finishes available to the market & have adapted our workshop to suit. We are able to spray finish furniture in our workshop spray booth facility, applying painted or heat & water resistant lacquered finishes in Matt, Satin or Gloss. We can also burnish a gloss finish to create a mirror Polyester finish. Copyright © 2019 Finishing Touches Surrey Ltd.